As Nicola Sturgeon calls for a new referendum on Scottish independence before the UK leaves the EU, and Theresa May prepares to trigger Article 50, it is increasingly clear that the simple message of the leave campaign to “take back control” does not translate into simple politics, law or process. The right to self determination is the right of all peoples to determine their own destiny in the international order. It is a right enshrined in international law in the UN Charter and in the International Covenant of Civil and Political Rights. In recent years, the principle has evolved to encompass a spectrum of self-determination including both internal (e.g. devolution) and external (e.g. secession or full independence) aspects of the right. Over the past 25 years, the United Kingdom has seen significant developments in devolved government that have reinforced the right to self-determination in the devolved nations. But the vote for Brexit has highlighted some serious gaps in the ability of the devolved nations and other British territories to determine their own destiny. Brexit marks a fundamental shift in the UK’s position in the international order but the decision to leave the EU goes against the wishes of the people in Scotland, Northern Ireland and Gibraltar who voted to remain in the EU. In Northern Ireland and in the Republic, concerns about the impact of Brexit on the border and on the stability of the Good Friday Agreement have been voiced since before the referendum. The Chief Minister of Gibraltar, where 96% voted remain, has said that a “hard Brexit” would be an existential threat to Gibraltar’s economy. 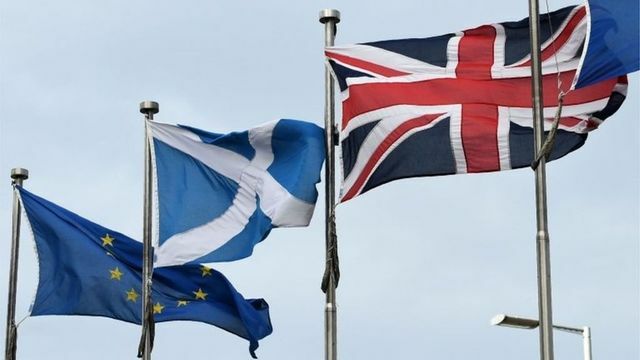 Although the Supreme Court in the Miller judgment rejected the argument that the devolved legislatures had the legal power to block Brexit, yesterday’s call for a new Scottish independence referendum should make sure that this is not something that can be ignored during the negotiations. Fundamental changes in the UK’s position in the international order along with the potential for shifts in the fabric of the UK itself may also cause other Overseas Territories and Crown dependencies to consider their place in the new order. They are not currently in the EU and so were not given a vote in the Brexit referendum. For many, independence is not a sustainable option. But their ability to represent their interests internationally will be changed by Brexit and it will be important for them to ensure that the new framework continues to respect their right to self-determination. The question of self-determination is not only an internal issue for the UK in the context of Brexit. Any deal will require the agreement of all remaining EU Member States. Both the status of Gibraltar and the parameters of any relationship between a possible independent Scotland and the EU are sensitive issues for Spain. The shifts in the political landscape in Northern Ireland following Brexit may have serious implications for the Republic of Ireland. The right to self-determination and what it means in practice is fundamental to both the political and the legal debates around Brexit – how the UK Government and the EU deal with this will shape the future of the European international order itself. The first minister says a referendum is needed to protect Scottish interests in light of Brexit - she said Scottish voters must be offered an "informed choice" between the path the UK government is taking, and independence. • What brought this on? • What is a Section 30 order?